1. Select the related word/letters/number from the given alternatives. Square: Octagon:: ?? The number of sides in a Octagon is double that of a Square. Similarly The number of sides in a hexagon is double that of a triangle. 3. The diagram below represents the students who study Physics, Chemistry, and Mathematics. What is the number of students who study both Physics and English? 4. The diagram below represents the students who study Physics, Chemistry, and Mathematics. What is the number of students who study all the three Subjects if S+ C=10 and S-C=2? 5. The diagram below represents the students who study Physics, Chemistry, and Mathematics. What is the sum of Students who study Chemistry alone and English alone? D is not there in the given word So STAND cannot be formed. 9. 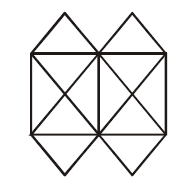 How many triangles are there in the following figure? 1) Select the related word/letters/number from the given alternatives. 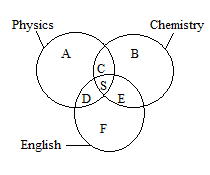 3) The diagram below represents the students who study Physics, Chemistry, and Mathematics. What is the number of students who study both Physics and English? 4) The diagram below represents the students who study Physics, Chemistry, and Mathematics. What is the number of students who study all the three Subjects if S+ C=10 and S-C=2? 5) The diagram below represents the students who study Physics, Chemistry, and Mathematics. What is the sum of Students who study Chemistry alone and English alone? 6) Correct the following equations by interchanging any two signs. 8) From the given alternatives select the word which cannot be formed using the letters of the given word. 9) How many triangles are there in the following figure?